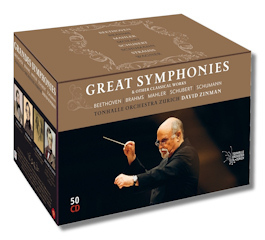 "Great Symphonies" shouts this sturdy box (I know, since I've dropped it). In reality, this set contains nearly everything that David Zinman recorded for RCA and Arte Nova during his tenure in Zürich. It's an impressive legacy, 13 composers represented across the Classical and Romantic eras. Only a few miscellaneous (and frankly unimportant) items are missing, and at least every complete album is here. These fifty discs – housed in equally sturdy slip cases – are a testament to an excellent musical partnership. In addition to the symphonies, one also gets many concertos, overtures, tone poems, and even a few Wagnerian vocal scenes. Since the box is so large, let's look at each composer (or series) carefully. David Zinman first came to international attention with these recordings of the Beethoven symphonies, so it's ironic that his achievement here is probably the weakest part of the box. Well-played, but also rather small in scale, neither the use of period-practice elements nor the revised editions of the scores makes a difference. The Seventh is swift, but singularly lacking in intensity. The second half of the Ninth Symphony is horribly rushed, and the entire performance is totally devoid of mystery. Thankfully, everything else from Beethoven is terrific. The overtures are exceptional, especially the rarer items, and there is surprisingly little to compete as far as similar sets on the market. With the concertos, Zinman doesn't miss a trick. The works for violin and orchestra are not only played with supreme confidence by Christian Tetzlaff, but these are also highly individual readings in the best possible way. I remember first hearing this version of the Violin Concerto and being blown away It remains a top choice among recent recordings. In the piano concertos, Zinman's preference for period-style pays huge dividends, and in Yefim Brofman he has a near ideal soloist. To top it all off, the recorded sound is gorgeous (less so in the symphonies). This also apples to the Septet and Triple Concerto, this latter work given a marvelously light and cohesive effort. One and all, this is an exceptional group of performances. Finally, the vocal works are also superlative, especially a Choral Fantasia that is as clear as one could wish for. The Missa also features admirable clarity, though for all the wonderful singing one could wish for just a touch more fervor. In any event, this doesn't really compete with Klemperer or Bernstein, but within the context of the overall achievement, it remains highly recommendable. Lean and straightforward, these readings will not appeal to those who believe that the Brahms canon should be a pseudo-mystical symphonic journey. But these are beautifully played renditions, happily without mannerism or excess. If Zinman occasionally misses the very real opportunities for suspense and emotional weight (and he hardly misses all of them) he makes up for it with a steady hand and a deep feeling for the Classical elements that make Brahms so unique. The sound is very fine, and if not a reference edition, this cycle is a lasting achievement. Mahler is hardly the first composer you might associate with Zinman, and he isn't Leonard Bernstein in terms of emotional excess. For many listeners, that's a positive, and there are indeed many things to appreciate in this cycle. Oddly, the symphonies I thought would respond least to Zinman's typically elegant, rather reserved style of musicianship get the best readings. The First, Third, Sixth, are outstanding accounts that rank with the best. The Fourth and Das Lied also have wonderful moments. Elsewhere, there are some less successful entries. The Second lacks the cosmic feel that I prefer in this music, but also the excitement of less grandiloquent versions from Slatkin and Levi. It reminds me of Kubelik: very musical, but somehow lacking. The same could be said of a less than wild Seventh. The Carpenter version of the Tenth might impress you more than it does me – I prefer Cooke after all these years – but it (along with Blumine and the Busoni filler) make this uneven cycle one of the most complete and there are many reasons to hear it. Throughout, the orchestra, soloists and assorted choirs are distinguished. In the choral symphonies, particularly the Second, more amplitude might be desired, but that is a matter of taste. Little need be said about these rather unmemorable performances, which pale in comparison to artists as diverse as Mutter and Oistrakh. This music arguably doesn't need a conductor, and Zinman brings nothing new to the party. Nor does Pamela Frank, but these are but two discs out of 50. Zinman's Schumann is another matter entirely, and is wholly outstanding. He's radically rethought his nice-enough Baltimore versions on Telarc and brought the very best of period-practice to these sometimes-heavy symphonies. Even classic versions by Bernstein might strike listeners as overly weighty after experiencing these razor-sharp accounts. The whole canon has seldom sounded so fresh and vibrant. This – along with Bernstein or Szell, just to name two – could easily stand as the only Schumann you'll ever need, and my only regret is that the concert overtures were never recorded as well. Originally found on an Arte Nova twofer, the sound is still amazingly fine. Much like his Beethoven, it could be argued that Zinman's Schubert is a touch too cautious and small-scale. Due to spotty availability in the States on a then-floundering RCA, these performances mainly appeared in the UK publications to warm acclaim. The violin encores are rare but superfluous, and despite fine playing and sound, this cycle fails to match other chamber-sized projects. Mind you, the early symphonies are beautifully proportioned and zesty. Like the Beethoven cycle though, Zinman fails to up the ante as the music grows in scale. For effortless musicality and not a hint of ego, Wand's Cologne cycle on the same label continues to impress. Even Amazon's notoriously – and relentlessly – positive band of reviewers have very little to say that's good. To be fair, the reception was much warmer in the UK, so there certainly are admirers of the present set. Another Arte Nova project that sold on the cheap, Zinman's Strauss was never seen as worthy of Kempe, Karajan, or Szell. While that assessment is largely correct, there are many fine performances. Each work with soloists is excellent, and the tone poems are lean and crisply phrased. For some of the lesser works, Zinman's insistence on clarity over decadence or excess pays huge dividends. The sound is not as consistently fine as the Schumann cycle or the Beethoven concertos, nor is the orchestra a true Strauss powerhouse like New York or Vienna. Still, the best performances are surprisingly intense, and well worth hearing. Recorded live at the very end of the Zürich years, this disc received almost no fanfare. As expected, the textures are appreciably light, and the playing is aptly virtuosic. However, the Ride of the Valkyries fails to take flight and is almost totally lacking in fantasy. In fact, the entire program is played so "straight" that one must wonder if Zinman likes Wagner or not. Despite this, Egils Silins sings well and has a real feeling for the music. This is not one of the stronger entries in this box. Oh, and the disc of trumpet and trombone concertos is a treat for brass fans. It is a finely played program, though certainly not revelatory enough to influence your purchase. Speaking of purchase, this is a bargain on Amazon right now, and typically sells for $80 or less. That's astonishing, even if the best of the Beethoven shows up now and again on Brilliant Classics. The Brahms, Schumann, and best of the concertos could almost cover what I paid, so consider everything else a very real bonus. Besides, some of that Mahler and Strauss is terrific and the Beethoven symphonies are favorites in some circles. Zinman's career was a little strange, to be honest. He was a reliable conductor of the European classics and Romantic Americana who has seemingly been around forever. I doubt that anyone in Zürich thought that he'd do so much for the orchestra when he arrived, and while not everything is uniformly fabulous, I imagine that everyone is very pleased with the overall results. There are things in this box you won't hear anywhere else. My box is numbered, suggesting this very reasonably priced import will someday disappear. If the contents appeal, I strongly urge you to make this investment.